... on the cocktail napkin of a polynesian restaurant in New York, with a little help from an animal-loving movie industry executive. February 17, 1964 is a date of paramount importance in the history of 2001; it's the day when the seeds of the movie as we know it were planted. That Monday, Stanley Kubrick was to have lunch with his friend Roger Caras in his favorite New York restaurant, the Trader Vic's at Fifth Avenue and 59th Street (at that time the director lived in a nearby apartment in Central Park West). Trader Vic's, still in operation in the States, is a polynesian-themed restaurant chain that was very fashionable in the mid 60's due in part to the so-called 'Tiki culture' fad. In this rather pictoresque setting (war clubs, carved masks, Japanese fishing floats hanging from the ceilings), at one point during the lunch Roger Caras asked Kubrick the fateful question: after the success of Dr. Strangelove, what was he going to do next? "No, I wouldn't. What are you going to do?" "I'm going to do something on extraterrestrials", Kubrick said, looking to see if Cares knew what that meant. "That's fantastic", said Caras. "As a matter of fact I'm doing a radio show on extraterrestrials tonight." [...] Kubrick scribbled some cartoons on cocktail napkins that depicted man's first meeting with aliens, an element he wanted to base 2001 on, but would later drop. [...] Upon telling me this story, Caras went to a filing cabinet and took out a folder. He said that Kubrick and Clarke were the only two men he ever met who could literally be called geniuses. He knew that their prospective collaboration would insure that anything they created should be preserved. Out of the file, he produced the cocktail napkins from Trader Vic's that still bore Kubrick's cartoons showing his concepts for 2001 - four years before the film would actually be released. a larger than life, cigar-smoking, Hollywood producer type - but a nice human being! (Caras) was the only member of the 2001 crew besides Kubrick who had read the whole Proust's 'In search of lost time'. 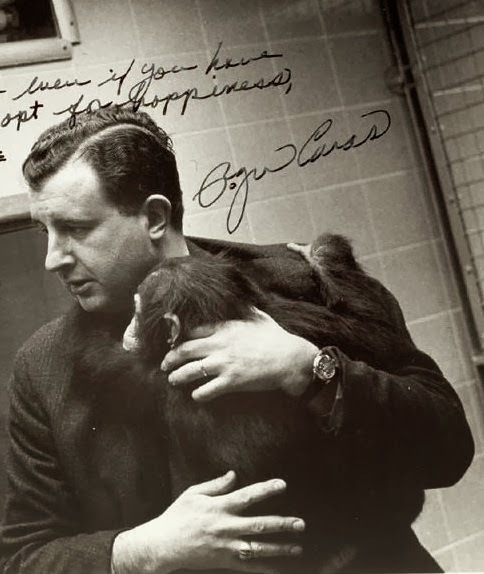 His love of nature, travel and diving had already befriended him a famous science fiction author who shared his passions, Arthur C. Clarke : the two had first met in 1959, when Clarke spent a weekend with Jacques Cousteau in Boston. 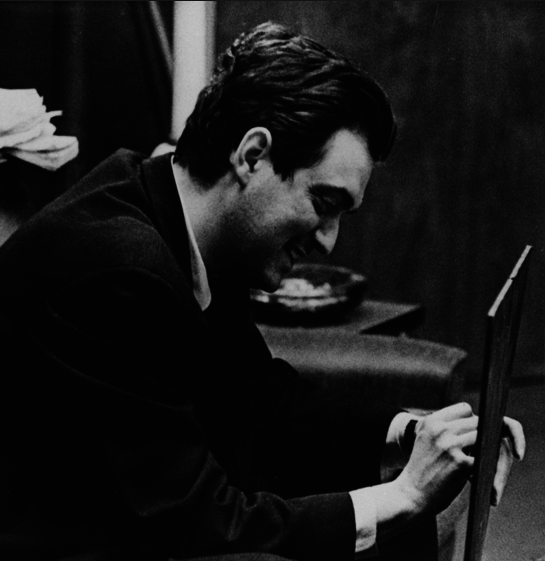 Caras eventually asked Kubrick who the writer [of the next movie] was going to be, but Kubrick didn't know yet. "I'm reading everything by everybody". This, Caras knew, was the thorough way Kubrick approached his projects. He'd pick the top twenty-five science fiction writers, have his assistant pull together everything they'd ever written, and read it. "Why waste your time?" Caras asked. "Why not just start with the best?" "But I understand he's a recluse, a nut who lives in a tree in India some place" said Kubrick. Roger Caras put that rumor to rest. "Like hell. He's not a recluse or a nut. He just lives quietly in Ceylon." "Jesus, get in touch with him, will you?" In that same day, February 17, Caras sent a letter to Arthur Clarke mentioning his dinner with Kubrick and his interest in a possible collaboration. The letter is mentioned in Peter Kramer's book 2001: A Space Odyssey, and here's the related entry in the online Kubrick Archive Catalogue. STANLEY KUBRICK - "DR STRANGELOVE," "PATHS OF GLORY," ETCETERA, INTERESTED IN DOING FILM ON ET'S. INTERESTED IN YOU. ARE YOU INTERESTED? THOUGHT YOU WERE RECLUSE. FRIGHTFULLY INTERESTED IN WORKING WITH ENFANT TERRIBLE STOP CONTACT MY AGENT STOP WHAT MAKES KUBRICK THINK I'M A RECLUSE? The rest, as they say, is history: Roger Caras passed the information to Scott Meredith, Clarke's agent, who began to define the next stage of the project; Caras would later leave Columbia to manage Kubrick's independent production company, Polaris, during the first part of the production of 2001, and served as director of publicity for the movie. Let's ponder a little more on the consequences of that polynesian lunch. As Kubrick biographer John Baxter rightly observed, had Caras suggested Isaac Asimov, Robert Heinlein, Ray Bradbury or any other among the other half dozen science fiction writers, 2001 would have been a vastly different movie. It would probably not have featured the discovery of an alien artifact as the core element of the plot, because the concept came from Arthur Clarke's short story The Sentinel, though the idea was, of course, not entirely original in sci-fi history. The famous "monolith", therefore, might have turned up in the story anyway, in another fashion or form; it is indeed important to note that Kubrick was looking for a way to describe, in cinematic form, mankind's future in space and the potentially most seismic event in human history: the 'first contact' with extraterrestrial intelligence. Therefore, although is undoubtedly fascinating to imagine Kubrick tackling other sci-fi concepts, like Bradbury's romantic, very human vision of the the martians in Martian Chronicles, or the futuristic warfare imagined by Heinlein in Starship Troopers, the theme of the 'first contact' was not as much in the style of the Asimovs, Bradburys and Heinleins, but it was prominent in Arthur Clarke's vision, expecially in a novel that indirectly influenced 2001, as shown in my previous post: Childhood's end (1951). 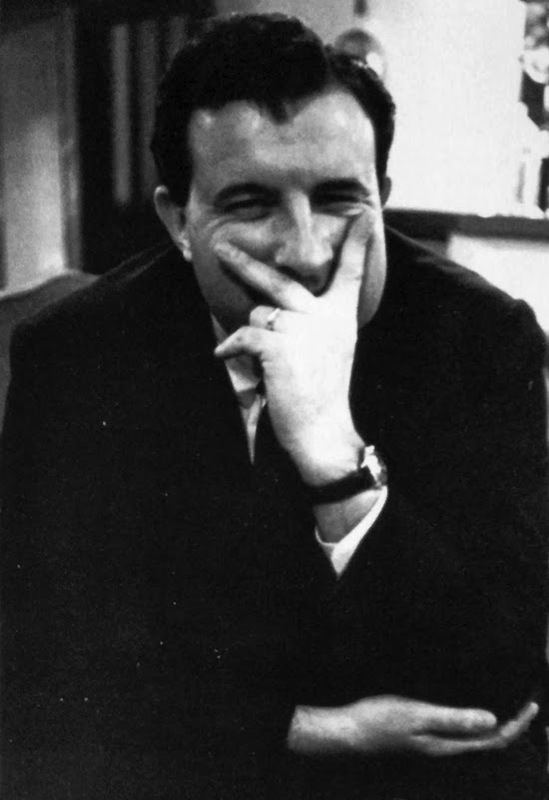 Clarke shared Kubrick’s vision of science “as savior of mankind and of mankind as a race of potential gods destined for the stars,” as science fiction writer Brian Aldiss states in Baxter’s Kubrick biography. In sum, Roger Caras was responsible for bringing together two artists for one of the genuinely legendary collaborations of director and screenwriter in cinema history. The next chapter of our story will be written on March 31, 1964, the day Kubrick and Clarke made 'first contact'. In that article and the ones which will follow, we'll explore in deep the relationship between the duo, and the other instances in which Caras proved himself a worthy companion for the dynamic duo, and a key player in the making of our favorite movie. See you then - fifty years ago! 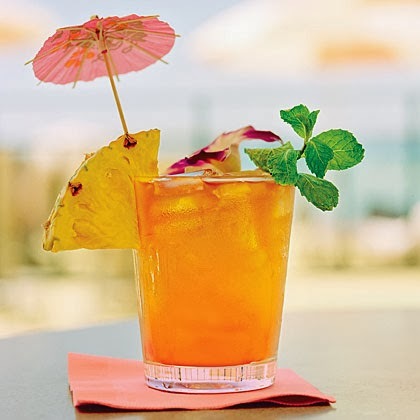 Cut lime in half; squeeze juice over shaved ice in a double old fashioned glass; save one spent shell. Add remaining ingredients and enough shaved ice to fill glass. Hand shake. Decorate with spent lime shell, fresh mint, and a fruit stick. John Baxter is a * V E R Y * unreliable source. I don't recommend this biography of Kubrick to anyone. I agree, having checked every single quote he made throughout the part of his book related to 2001. I mentioned him here to introduce the concept of how Clarke was fit to SK because of their thematic affinity.